This Benefit Report for Year 2015 for knowwhereyourfoodcomesfrom.com, Inc. has been prepared by Frank W. Barrie, the benefit corporation’s President/Secretary. The incorporator, Frank W. Barrie, is the President and Secretary of the benefit corporation pursuant to organizational meeting resolutions dated August 22, 2012. On October 16, 2014, the benefit corporation issued one-hundred shares of corporation stock to Frank W. Barrie, and on December 19, 2014, shares of corporation stock were issued to three minority shareholders. Pursuant to the benefit corporation’s bylaws, at the annual meeting held on February 2, 2015, the shareholders elected three directors of the benefit corporation: Frank W. Barrie, Albany, NY; Edward Stevens, Loudonville, NY; and Kathryn Sikule, Albany, NY. At the Annual Meeting of the Board of Directors on February 10, 2015, Frank W. Barrie was elected President of the Board and Edward Stevens was elected Secretary of the Board. (32) A restaurant review, Delicious Farm to Table Dining in Orlando, Florida (12/21/15). (10) Gardening topics including community gardens, home food preservation, container gardening, gardening tips and edible garden design/install. Small ads/logos appearing on the website during 2014 have promoted the following organizations/entities (at no cost to these organizations/entities): (1) Native Seeds, www.nativeseeds.org, (2) the documentary, Brunswick, www.brunswickfilm.com, (3) Equal Exchange, www.equalexchange.coop, and (4) American Farmland Trust, www.farmland.org. 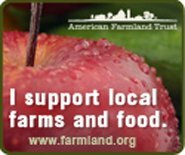 These 4 organizations/entities and two businesses reflect principles in harmony with the six principles of the Food Alliance certification program delineated above. In 2015, the website also ran the ads/logos for two praiseworthy businesses: Liberty Tabletop and Pure Alaska Salmon Company. Liberty Tabletop is now the only manufacturer of flatware in the United States, and its concern for the American consumer’s health and safety is reflected in its commitment to only use stainless steel from American steel mills that follow stringent environmental and safety standards, to meet or exceed all federal and state environmental regulations and standards, and to never use harsh or carcinogenic chemicals in its manufacturing process. Pure Alaska Salmon Company markets wild Alaska salmon which is harvested sustainably, especially important in light of the difficulty of knowing where salmon for sale in markets and restaurants comes from. A small ad also appeared on the three New York related pages for dining, CSA farms and farmers markets, respectively, to promote the Bees Knees Café operated by Heather Ridge Farm on the farm in Preston Hollow, NY which has a “fiercely local” food menu (at no cost to this farm café)).